We’re joined by Helen Buckland from the Sumatran Orangutan Society, an organization that works to protect the habitat of Sumatran orangutans from a variety of threats. Crucially, palm oil plantations in particular continue to play a major role in jeopardizing these animals. During our short but informative interview, Helen educates both us and our listeners about the intersecting issues of environmental degradation, globalization, and the orangutans’ individual plight. News from: New York Times and News Online. 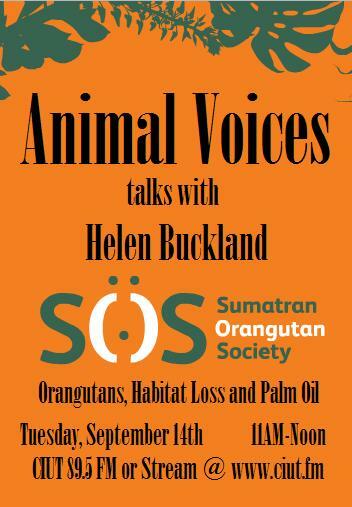 Tags: endangered animals, Helen Buckland, orangutan, palm oil, SOS, Sumatran Orangutan Society. Bookmark the permalink. Among vegans this shouldn’t even be a debate: palm oil kills animals, you stop eating it. Thanks, Lauren. I’m glad to hear you’re back! This was indeed a good show; too short, though, and I’d like to hear more addressing of the vegan complicity in this horror. I realize that a LOT of foods, not just vegan ones, contain palm oil, but I suppose it’s the non-critical adulation of Earth Balance by vegans that I find very closed-minded. In the passion to convert people to veganism, we may not look hard enough at some of the underlying issues of the ways we do that — ie, with food that comes from some of the worst transgressors of animal lives and the environment (and probably human labor as well): Silk/White Wave, Lightlife, Hain/Celestial — unfortunately the list goes on and on. I’m not really sure what the answer is; I know I love both sugar and cupcakes, but there was a time I loved cheese, too. Still, people who would balk at eating frosting-less vegan cupcakes might eagerly devour them. Or someone who might prefer dairy creamer might find Silk to be palatable or even a tasty substitute.